Many ancestral tombs of the Dunmer were nearby. The banks of this river were very steep, so steep it was sometimes called a gorge. 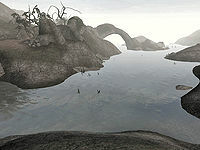 This could make crossings difficult, especially since it wasn't deep enough to allow boat transport, but the Dunmer made do with a series of rope bridges. Kagouti had been known to pose a problem for travellers nearby. During the Red Year of 4E 5, the eruption of Red Mountain devastated the area, ostensibly wiping Gnisis from the face of Tamriel. An eyewitness reported that the waters around Gnisis were vaporized into steam by a wall of fire so high it blotted out the sun. She may have only survived because she was knocked into the dried riverbed, sparing her from some of the flames.